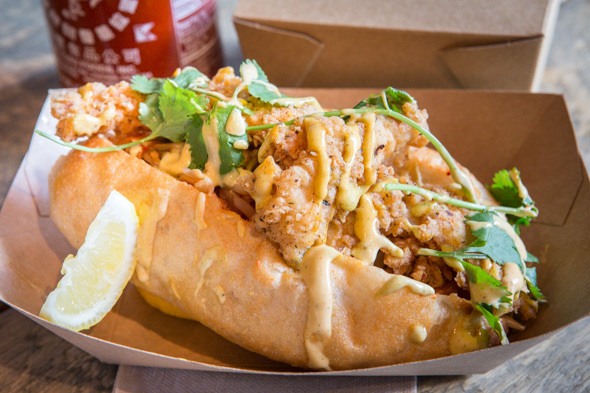 Fresh Off The Boat is a newly open seafood-centric sandwich shop with an Asian skew. 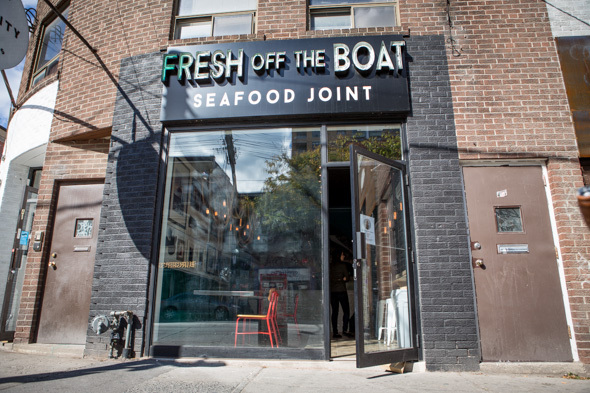 Irreverently named, with tongue firmly planted into cheek, it appropriates the derogatory term and embraces the double entendre - fitting for a seafood spot, no? He might be a transplant to Toronto himself, but owner Quinten Tran is hardly new to the area; he grew up on Crawford, his family once owned a Vietnamese restaurant on Spadina (the new generation staffs the current restaurant too), and he was one of the founders of the Buster's Sea Cove food truck. The concept at this new spot is a culmination of all these experiences. I really dig the design of the place, but don't count on spending too much time here. Seating is limited and the focus is decidedly on takeaway. 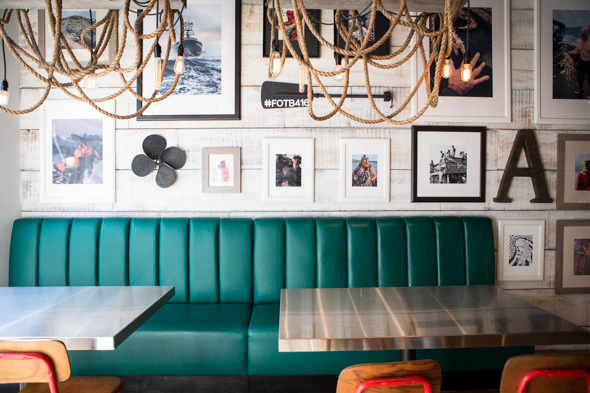 The room consists of only a couple tables pushed up against a bright green banquette under a collection of framed photos featuring tough-guy crabmen and tattoo-like koi. A wall of fiery red Sriracha bottles serves as a decorative feature against a backsplash of black and white fish illustrations. Ordering takes place through an over-sized porthole that is currently a cash-only operation. The signature sandwich is the FOB ($11.95), a dish that straddles both po'boys and banh mi. It's loaded with spicy kimchi and sprouts before being topped with peppery battered catfish and slathered with spicy aioli. It is messy to eat but worth it. There's also a soft shell crab sandwich ($14.95) dressed with remoulade, lettuce, tomato, and featuring specimens so big that their legs and claws dangle over the edges of the sweet, dense circular brioche bun. At the tail-end of the season (fresh soft shell crabs are typically only available from May to October), these are excellent. The batter is fried to a golden hue that fuses to the thin-shelled exterior for a perfect crisp crust that doesn't flake off as its eaten -- the seafood inside is succulent. The Maine lobster roll ($15.95) adheres to tradition, featuring barely-dressed morsels of picked shellfish with celery and chives served cold and overflowing from a toasty split-top bun. Fresh cut fries, a pickle spear and a creamy broccoli slaw studded with sunflower seeds and raisins complete the meal. 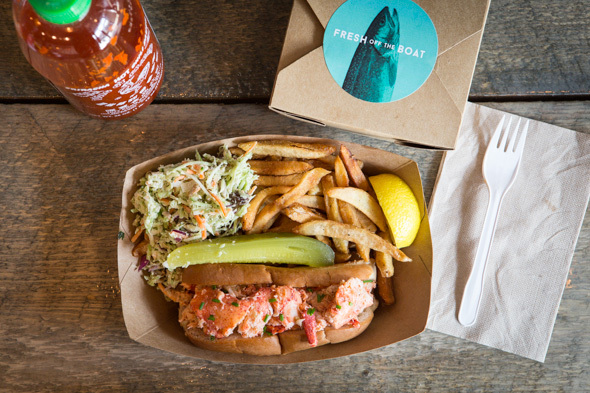 A non-traditional lobster roll is to be featured too; the Maineland spin will be a buttery hot version with garlic and onions built on an irregular-shaped bao. On this visit I've entirely ignored the healthier alternatives, though it should be noted that the menu also offers a range of grilled fish specialties, like halibut and mahi mahi, either in sandwich form or on house or kale salads. 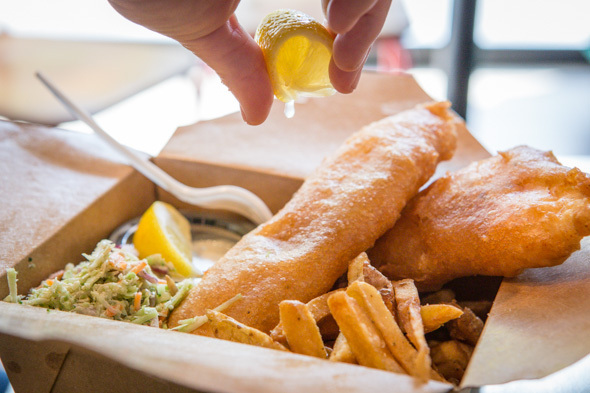 I also caught a glimpse of the traditional beer-battered halibut and chips ($14.95) and while I didn't try it this time, it looks great. 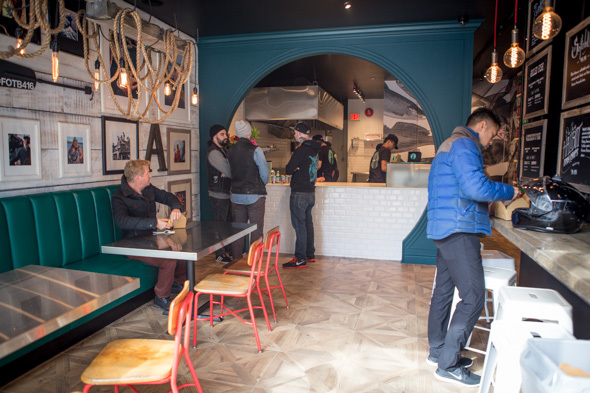 Squeezed in between Kinton Ramen and Rose City Kitchen , in the same block as Banh Mi Boys and across from Burger's Priest at Queen and Spadina, this place adds to what has quickly become a densely delicious corner for a crop of homegrown fast food outfits.